Price: £10.19 (incl VAT) Sorry, this item is currently unavailable. Click here to receive notification when this product comes back into stock. Ear wax protects the ears from dirt or bacteria, which can cause hearing problems. To combat excess wax build up ear rinsing may be necessary. 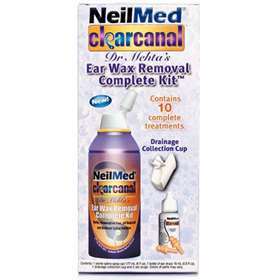 Neilmed Clearcanal kit can be used to soften, loosen and flush out unwanted build ups occurring and causing infections. 1 Can Sterile Saline Spray 177ml. 1 Bottle of Ear Drops 15ml. For adults and children 12 and over. Tilt head sideways and place 10 drops into each ear canal. The tip of the bottle should not enter the ear canal. Keep drops in the ear for 10 minutes by keeping the head tilted or placing the earplugs in ears. It is normal to feel warmth in the inner ear. Attach the special drainage collection cup to the canister to avoid the rinse solution dripping out of your ear. Flush ears with the Neilmed Clearcanal nozzle for 10 seconds or as desired to achieve adequate flushing. Gently tilt head side to side to drain any residual liquid and dry ears with a clean dry towel wrapped on a finger. On rare instances, individuals may experience pressure in the ears. If this occurs, stop rinsing. Carbamide Peroxide 6.5%, Glycerin, Oxyquinoline. If you have had an allergic reaction to Carbomide Peroxide or other ingredients in the dropper bottle. If you have an injury or perforation of the eardrum or after ear surgery, unless directed by a doctor. Do not use more than twice a month. Meniere's syndrome or those experiencing dizziness, vertigo, impacted ear wax or other ear problems. USPS Grade Water, USP Sodium Chloride (9 mg/ml), USP Sodium Bicarbonate (0.5 to 1.0mg/ml) to neutralise pH. Product code: 3706348 Price: £10.19 (incl VAT) Sorry, this item is currently unavailable. Click here to receive notification when this product comes back into stock.